Within the EU project GANNET53 two different clinical trials are conducted which are accompanied by companion diagnostics activities, translational research and the establishment of an extensive biobank. The first clinical trial is the GANNET53 CLINICAL TRIAL consisting of a Phase I and a Phase II trial. The GANNET53 trial is a Europe-wide multi-centre clinical trial, involving national trial groups to safeguard sufficient enrolment of patients. Recruitment in the GANNET53 Phase II clinical trial was closed in September 2016. The EUDARIO CLINICAL TRIAL is a European, multi-center, randomised three-arm open-label Phase II trial in mutp53, platinum-sensitive ovarian cancer patients. It evaluates the safety and efficacy of Ganetespib in combination with Carboplatin on one hand and the Poly(adenosine diphosphate-ribose) polymerase (PARP) inhibitor Niraparib on the other hand in comparison to standard treatment options. THE EUDARIO CLINICAL TRIAL IS CURRENTLY OPEN FOR RECRUITMENT. 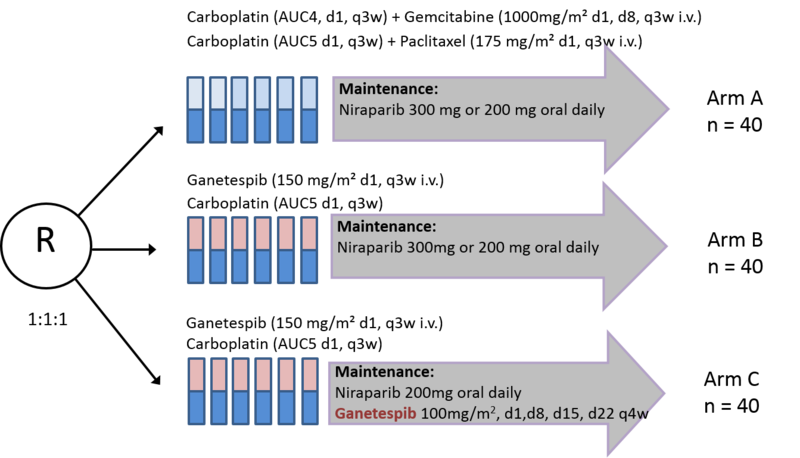 The EUDARIO trial is an open label three-arm randomised Phase II study where the efficacy of Ganetespib 150mg/m2 in combination with Carboplatin AUC5 followed by maintenance treatment with the PARPi Niraparib (+/- Ganetespib in arms B and C, respectively) is compared versus standard Carboplatin combination treatment (investigator`s choice: Carboplatin puls Gemcitabine or Carboplatin plus Paclitaxel, respectively) followed by maintenance treatment with Niraparib in platinum-sensitive ovarian cancer patients. The EUDARIO trial is also a Europe-wide multi-centre clinical trial, involving national trial groups to safeguard sufficient and fast enrolment of patients. The EUDARIO trial will be open in Belgium, Austria, Germany, France and Italy via the respective national trial groups. BGOG trial centre is the legal sponsor and the lead trial group of the EUDARIO trial. All core competences related to the performance of clinical trials are available in the BGOG trial centre and the national trial groups. With this concept we avoid the inclusion of for-profit service providers. In the GANNET53 Clinical Trial (EUDRACT Number: 2013-003868-31) women with platinum-resistant, high-grade serous, high-grade endometrioid, or undifferentiated epithelial ovarian, fallopian tube or primary peritoneal cancer were addressed. The aim of the GANNET53 trial was to combat metastatic platinum-resistant ovarian cancer with a novel drug strategy that targets the central driver of aggressiveness and metastatic ability of epithelial ovarian cancers, namely stabilised mutant p53 protein, for degradation via an innovative Hsp90 (heat shock protein 90) inhibition mechanism in order to substantially improve SURVIVAL. The main target of this GANNET53 drug strategy is a central driver of tumour aggressiveness and metastatic ability, namely mutant p53, via an innovative new Hsp90 (heat shock protein 90) inhibition mechanism. The most advanced, second-generation Hsp90 inhibitor is used, Ganetespib. In the first part (Phase I) of the GANNET53 trial the safety of Ganetespib in a new combination with standard chemotherapy (Paclitaxel weekly) was tested in high-grade serous, high-grade endometrioid or undifferenciated, platinum-resistant ovarian cancer patients. In the second part (randomised Phase II) the efficacy of Ganetespib in combination with standard chemotherapy versus standard chemotherapy alone was examined in this group of ovarian cancer patients. The GANNET53 Clinical Trial was closed in September 2016. The objectives of the GANNET53 Phase I trial was to define the safety of Ganetespib in a new combination with the taxane Paclitaxel. The GANNET53 trial was a Europe-wide multi-centre clinical trial, involving national trial groups to safeguard sufficient enrolment of patients. The GANNET53 trial was open nation-wide in Austria, Germany and France via the respective national trial groups and at the high-volume University Centre Leuven in Belgium. Phase I will be open at Medizinische Universität Insbruck, Charité – Universitätsmedizin Berlin, Universitätsklinikum Hamburg-Eppendorf and Centre Anticancereurx Leon Berard via their respective national trial groups (AGO Research GmbH, Nord-Ostdeutsche Gesellschaft für Gynakologische Onkologie e.V., ARCAGY Association) and in the single high-volume University centre Leuven. This will ensure fast patient enrolment. Phase I covers a timeframe of 10 months (6-8 months active enrolment, remaining time for follow-up). An estimated number of 9-18 platinum-resistant high-grade serous, high-grade endormetrioid, or undifferentiated ovarian cancer patients will take part in the dose escalation/de-escalation study with a traditional 3+3 design. There will be no intra-patient dose escalation. The first 3 patients will be treated with a starting dose of 100 mg/m2 Ganetespib and the standard dose of Paclitaxel weekly (80 mg/m2, fixed dose). If this dose does not cause significant adverse effects in the first cohort during cycle 1 (weeks 1-4), Ganetespib will be escalated to 150 mg/m2, as a second cohort takes part in the study. If the dose of 150 mg/m2 does not cause significant adverse effects, it will be used in the GANNET53 Phase II trial. In the unexpected case of significant adverse effects at 150 mg/m2, a dose reduction of Ganetespib to 125 mg/m2 is permitted. The observation period will last from the first day of cycle 1 to the last day of cycle 2. At the dose level going to be used in Phase II an additional cohort of 3 patients will be included. Each patient will receive 2 cycles of experimental therapy. All patients may continue to receive Ganetespib in combination with paclitaxel until progression if a benefit for the patient has been observed. Patients who did not appear to have had a benefit of the combination therapy will be treated according to physician‟s choice. Phase II will be open nation-wide in Austria, Germany and France via the respective national trial groups with their assigned centres and at the single high-volume University Centre Leuven, Belgium to ensure sufficient enrolment. Phase II covers a total time frame of 4 years (2.5 years of active enrolment, 1.5 years of follow-up). SYNOPSIS: Eligible patients will undergo central histopathological review (Charité – Universitätsmedizin Berlin) of archival ovarian cancer tissue at primary diagnosis to ensure high-grade serous, high-grade endometrioid, or undifferentiated histology of tumours. 200 patients with elegible histological subtypes will be randomised in a 2:1 ratio (222 patients: 148 + 74) to receive either Ganetespib and Paclitaxel weekly or Paclitaxel weekly alone. The Ganetespib dose used depends on results of Phase I. For Paclitaxel weekly the standard dose of 80 mg/m2 is applied. Patient will receive the respective therapy until disease progression. All patients included will be analysed for p53 mutational status from archival ovarian cancer tissues at primary diagnosis. This analysis will be performed during ongoing Phase II.